A subtle way to show your support. The ribbon is a combination of several existing ribbon patterns, modified to blend within the rows of cables. I worked this one in a neutral oatmeal color, as a gift for my father-in-law, but you could use any color. 18 sts x 24 rows = 4"
3/3 LC = Sl 3 sts to cable needle and hold in front of work, k3, then k3 from cable needle. 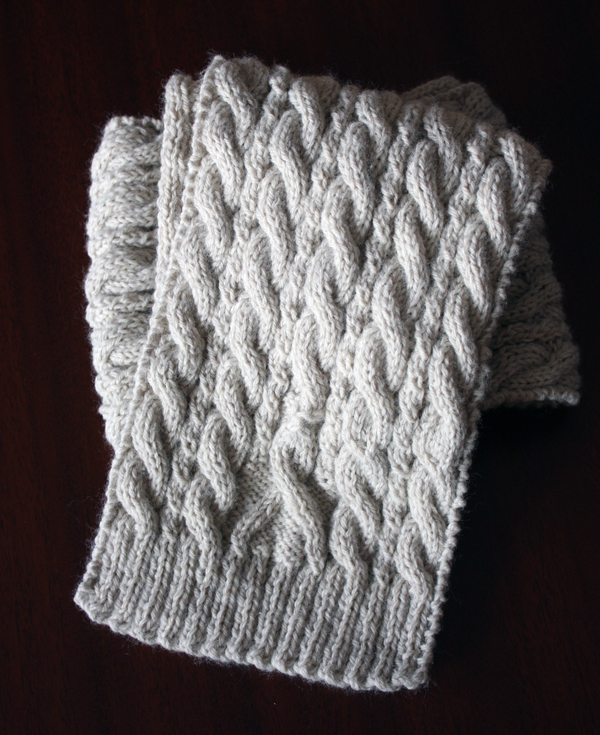 Work in Ribbing Pattern until piece measures 2 ½ in. from beginning. Work one sequence of Ribbon Pattern (22 rows), then Rows 7-8 of Cable Pattern. Continue working in Cable Pattern until desired length. Work Ribbing Pattern for 2 ½ in. Bind off all stitches, weave in ends, block lightly. Probably a dumb question, but what is K1 tbl?